Every day we hear expressions of disunity in the Jewish world. Religious vs. Secular, Chasidic vs. Misnagdic, Ashkenazi vs. Sephardi, right wing vs. left wing, Orthodox vs. Conservative vs. Reform, Litvak vs. Galitzianer vs. Yekki, and so it goes. Linda Allen, a Professor of Finance at New York University realized that there was one common bond that unites us that cannot be broken: we are all Jews. Further, Allen wanted to connect with people using a vehicle that speaks to everyone: music. She knew that she found the right song when she heard Schlock Rock’s Lenny Solomon (interviewed on Jewlarious here) perform his original song Ani Yehudi (I am a Jew) as she said it was the “best Jewish unity song ever written.” So Allen along with her husband, Elliot, and her brother and sister-in-law, Dr. Alan and Karen Mazurek got the idea to make a song that adapted Solomon’s lyrics and drew from a large cross section of Israeli recording artists in a “We Are the World” style collaboration, and they agreed to bankroll the production. 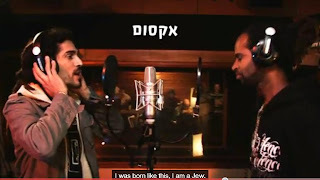 The resulting song fuses the styles of popular Israeli artists Kobi Oz, Yirmi Kaplan, Lior Almaliach, Yehuda Katz, and Gadi Altman, as well as hip-hop artists Fishi HaGadol and Aksom. We think they've got a winner. How about you? Enjoy! wonderful moving song. I love it!